Construction is officially underway on Foster + Partners‘ sustainable masterplan for the Hongqiao Vantone SunnyWorld Centre, a sustainable mixed-use development in the heart of the Shanghai Hongqiao Central Business District. The 1.7 million-square-foot development will include include offices, restaurants and shops. The new development is centered around a 10-acre park, and it’s designed to maximize natural light and ventilation. 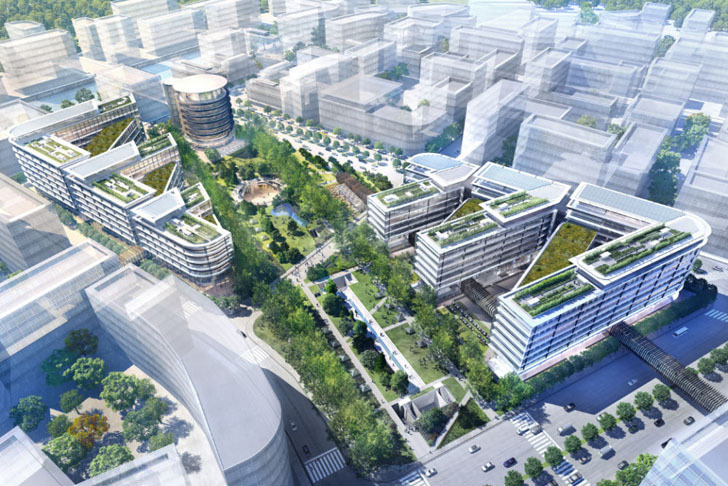 The enormous mixed-use development will bring a heavy dose of greenery to the Shanghai Hongqiao CBD. By burying all of the parking for the development underground, Foster + Partners were able to able to devote a large portion of the property to public space. The office buildings are arranged as a series of triangular forms that are located on the edges of the site, maximizing views of the park below. 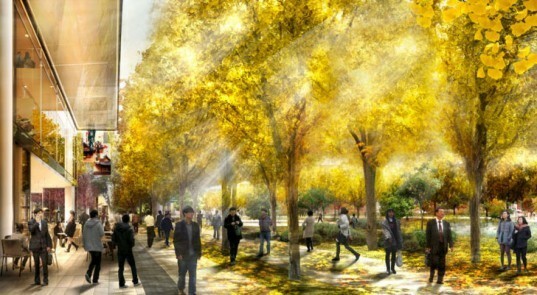 “We aim to create a destination and a genuine public place that is a positive contribution to the future growth of Shanghai, but is also rooted in the spirit of the past and the traditions of this great city – lively and bustling, filled with the business of everyday life,” said design director Grant Brooker in a statement. The buildings’ narrow floor plates are also designed to maximize the use of daylight and natural ventilation, which should help to improve their energy efficiency and keep operations expenses down. To further minimize their impact, buildings also feature green roofs and landscaped terraces. Construction is officially underway on Foster + Partners' sustainable masterplan for the Hongqiao Vantone SunnyWorld Centre, a sustainable mixed-use development in the heart of the Shanghai Hongqiao Central Business District. The 1.7 million-square-foot development will include include offices, restaurants and shops. The new development is centered around a 10-acre park, and it's designed to maximize natural light and ventilation.